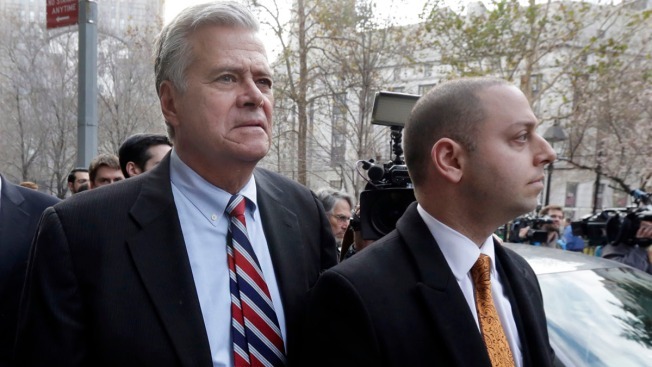 Former New York state Senate leader Dean Skelos, left, and his son Adam Skelos leave federal court during their trial in April 2016. A former New York state Senate leader and his son got business executives to arrange no-show jobs for the son in a brazen "family shakedown" that corrupted the senator's office, a federal prosecutor said Tuesday at the retrial of the pair on bribery and extortion charges. Assistant U.S. Attorney Thomas McKay called the once-powerful Long Island Republican and his son, Adam, "partners in crime" who strong-armed the businesses into funneling hundreds of thousands of dollars to the son for various fake projects. If their victims didn't agree, the senator made it clear they risked losing his backing on legislation they needed for financial success, he said. The companies felt "constant pressure from Dean Skelos - the fear he would punish them by using his official power if they didn't pay up," added. "They were the targets of the Skelos family shakedown." The prosecutor also asked the jury to reject defense arguments that the elder Skelos was a devoted father merely looking out for a child who had hit hard times. A federal appeals court found jurors in ex-Sen. Dean Skelos and son Adam Skelos' case were wrongly instructed, in light of a Supreme Court decision following their 2015 convictions. Checkey Beckford reports. "No one disputes Dean Skelos loves his son," McKay said. But, he added, "You can't commit a crime and say it's ok because 'I did it to help my son.' That argument is insulting to the mothers and fathers who help their children without committing a crime." Defense closing arguments at the trial in federal court in Manhattan were expected Wednesday. 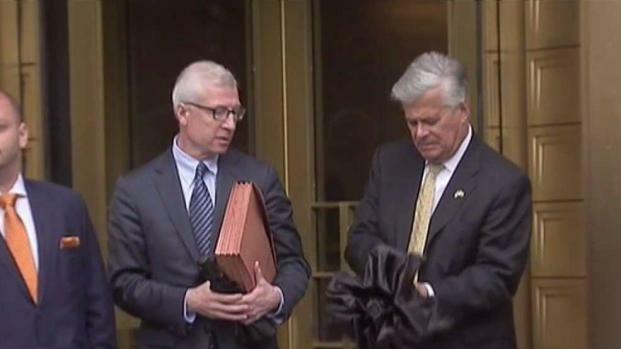 The jury has heard testimony from Anthony Bonomo, the CEO for an insurance company who described how Adam Skelos stopped turning up for a $78,000-a-year sales job. But he testified he didn't consider firing him because he "didn't want Adam's problem to become a wedge for our legislative pursuits in Albany." Another witness, title company partner Tom Dwyer, testified that he was the bag man for a real estate developer who decided to give Adam Skelos a $20,000 bribe disguised as a referral fee for title insurance. He said he delivered the cash in an envelope during 2013 lunch on Long Island. The developer, Charles Dorego, made the payment "to get the senator off his back," McKay said. Skelos, 70, testified in his own defense last week, telling the jury he was constantly worried about a son who had emotional struggles as a child and financial woes as an adult. He claimed he was merely asking the businessmen to help out as friends. Former New York Senate majority leader Dean Skelos was sentenced to five years in prison Thursday on federal corruption charges -- the second major political figure in the state to be banished to a long incarceration in less than two weeks. Jonathan Dienst reports. The father and son were convicted in 2015 of extortion, conspiracy and bribery. But a new trial was ordered by a federal appeals court in Manhattan after the U.S. Supreme Court narrowed the law regarding public corruption as it reversed the conviction of former Republican Virginia Gov. Bob McDonnell.